First visiting Central Asia in 2002 as part of my work for a development bank, I marvelled at the jewels of Islamic architecture, the astonishing range of art and crafts, and the warm hospitality. Since then I have travelled frequently to the region and began Uzbek Journeys in April 2010. I now spend about 6 months every year in Central Asia. There is nothing I enjoy more than sitting on a rooftop with a pot of green tea under a blue, blue sky gazing over turquoise domes. Listening to the tales of artisans whose families have been ceramists, weavers, embroiderers, woodblock printers, metal workers and wood carvers for generations has broadened my knowledge of these traditions as well as my collection. I want to make it easier for travellers to experience this fascinating, though remote region. I also wish to support Central Asian artisans. Based on conversations with clients, and coordinating with reliable travel agencies, I organise special tours in spring and autumn to Uzbekistan and Kyrgyzstan. Drawing on my extensive network of expert guides, craftspeople, artists and small hoteliers, I create a personal and rewarding experience of Central Asia. Note: If you would like a tailor-made tour to Uzbekistan, just for you, or for a couple or small group, please contact Uzbek Journeys. I am more than happy to provide you with contacts of clients who have travelled with Uzbek Journeys. Please note that Uzbek Journeys is an online travel agency only. There is no facility to accept bookings from participants who do not have regular internet access. All documentation, updates, visa forms etc are sent and received electronically. I hold a NSW Travel Agents Licence - number 2TA08821. 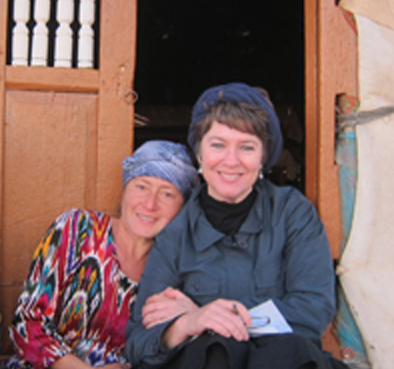 I hope you will join an Uzbek Journeys tour and discover this fascinating region.